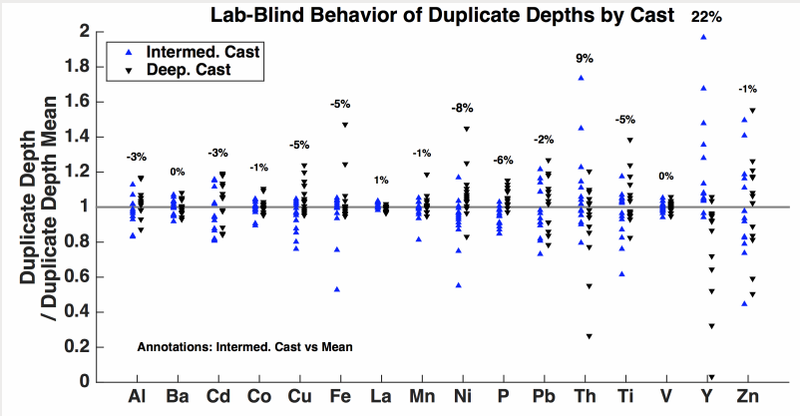 This dataset comprises all trace element measurements made on suspended particulate samples collected by filtration from the towed fish (bottle data in a separate dataset) during the US GEOTRACES GP16 cruise, R/V Thomas G Thompson 303. 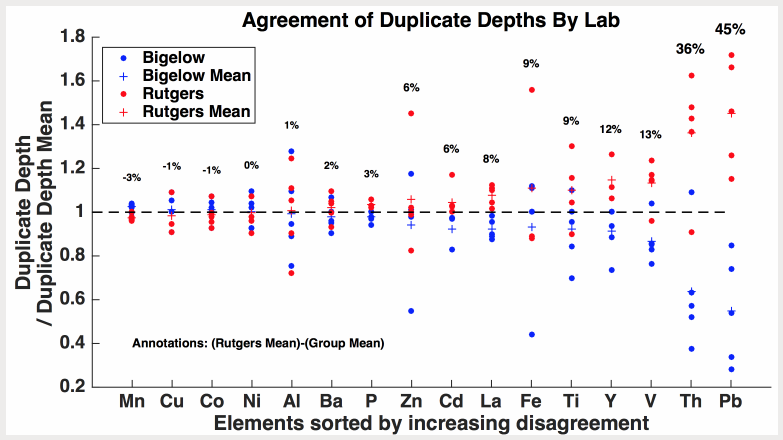 It combines data produced at Bigelow Laboratory (upper water column) and at Rutgers University (intermediate and deep water column). NOTE: At station 18, near-plume depths were sampled in two separated casts deployed at two different times during the long station. The results are interleaved in this data file, but can be distinguished and separated by using sequential GEOTRACES numbers (always every other number since only every other bottle was used for particle sampling). Trace element concentrations in suspended particles were collected from the towed GeoFISH (bottle data are in a separate dataset) and then by filtration onto 0.45um Supor (Pall Gellman) polyethersulfone filters. Particulate matter on filters was completely digested in hot acids and resulting solutions were analyzed using inductively-coupled plasma mass spectrometry (ICP-MS). 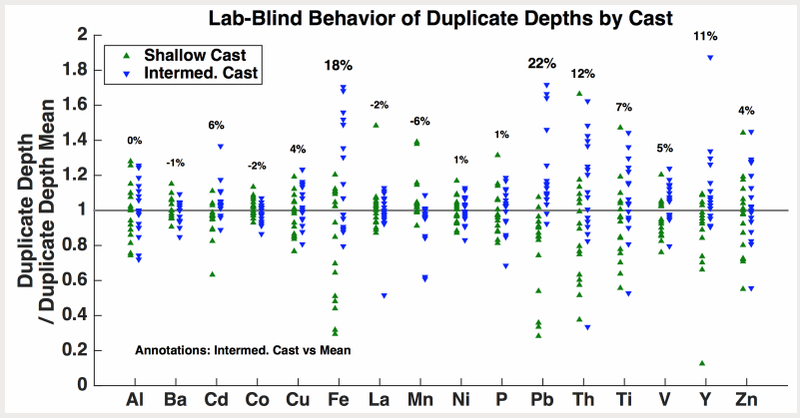 Labile (weak acid leachable) particulate element concentrations are also reported for the samples analyzed at Bigelow Labs. Cutter, G. A., Andersson, P. S., Codispoti, L. A., Croot, P. L., Francois, R., Lohan, M. C., Obata, H. and Rutgers Van Der Loeff, M. M.: Sampling and Sample-handling Protocols for GEOTRACES Cruises,, 1–238 [online] Available from: http://www.geotraces.org/libraries/documents/Intercalibration/Cookbook.pdf, 2010. Cutter, G.A. and Bruland, K.W. 2012. Rapid and non-contaminating sampling system for trace elements in global ocean surveys. Limnology & Oceanography: Methods 10: 425-436. Ohnemus, D.C., M.E. Auro, R.M. Sherrell, M. Langerstrom, P.L. Morton, B.S. Twining, S. Rauschenberg, P.J. Lam. 2014. Laboratory intercomparison of marine particulate digestions including Piranha: a novel chemical method for dissolution of polyethersulfone filters. Limnology and Oceanography 12:530-547. Planquette, H. and Sherrell, R.M. 2012. Sampling for particulate trace element determination using water sampling bottles: methodology and comparison to in situ pumps. Limnology & Oceanography: Methods 10: 367-388. Twining, B.S., Rauschenberg, S., Morton, P.L., Ohnemus, D.C., Lam, P.J. 2015. Comparison of particulate trace element concentrations in the North Atlantic Ocean as determined with discrete bottle sampling and in situ pumping. Deep Sea Research Part II 116: 273-282. Super GeoFISH samples were collected from surface waters (~2m) using a towed ‘fish’ deployed by Ken Bruland’s lab, and typically used to collect a surface sample upon arrival at the station location, for use as the shallowest sample of the resulting vertical concentration profile for that station. The ‘fish’ water was cleanly pumped directly into the bottom stopcock of a Go-Flo mounted vertically in the clean “bubble” (temporary clean room). Sampling then proceeded identically to procedures used for GO-Flo samples collected at depth, except that the GO-Flo was not inverted for mixing as potential particle settling time was negligible. All surface samples were analyzed by the Twining group at Bigelow Laboratory.